Recently, it has come to my attention that some individuals have been making accusations against the current Crown of Atenveldt. I have been told that You are interested in the accounts of those who have witnessed events first hand. If I have been informed incorrectly, please forgive this letter. I do not wish to intrude upon private matters. However, I cannot remain silent if you seek information that I might have. I am a Kingdom Officer, and have had reason to discuss many matters with Their Majesties. I attended Their first Crown List, which came to such an unfortunate end. I have also had personal experience with some of those who have signed the petition concerning Their Majesties. I have enclosed a resumé as well. I was not shown the petition before it was posted on the Rialto. Although I have heard it claimed that it was offered to all the Kingdom Officers to sign, I believe it was carefully kept from me. I have no reason to believe any of the items listed in this petition. I have seen no actions on the part of Their Majesties to support those claims. I am aware that lack of evidence is not proof of innocence. However, it still remains that I have seen nothing done by the Crown to justify these accusations. On the other hand, there is a pattern of activity on the part of individual signers that suggests to me the petition signals a power play to occupy the position of authority left vacant by Their Graces Brion and Anna and Trelon and Varia when they left the Kingdom. I attended that list, one of the few Artemisians to do so. My champion Sir Bertrand d'Avignon fought for me, and I paid close attention to the fights. Even though I am a woman, I have heavy fighting knowledge and experience. Sir Bertrand has insisted that I know enough to judge his performance on the field as worthy of my honor. Before I became a Laurel, I was squired to Lansgraf Baron Sir Sagen von Osten-See who is now Deputy Society Earl Marshall. There were difficult judgment calls to make during the entire list. I watched the King struggle with decisions about the fights all day. He pulled quite a few of the combatants from the field to talk to them, some multiple times. He really wanted to believe in the honor of all who fought that day. Even though he might have lingered a bit too long, I firmly believe that he made the right decision that day. In fact, had he not voided the list, both I and Master Malcolm were prepared to throw our medallions at his feet in resignation of our fealty. It is really easy to interpret events to malign the Crown, but I was there. I saw nothing criminal or incompetent, just the standard hesitation of someone in his first reign. I find it exceedingly disturbing that Katie and Mann [and other signers of this Petition] were all also involved in the actions that resulted in the banishment of Their Graces Mark and Jacqueline von Newman. Katie was the instigator in the removal of the Solar Tanista Lady Ronna Rosgaille Soilean Soilleir for Ronna's inability to swear the oath of fealty as written, and refused to offer Ronna an alternative form of the oath as required and requested by Society Seneschale Duchess Sedalia MacNare. I find it disturbing that these same individuals are attempting to revoke the fighter authorizations of those who fought in the Crown Lists - with the exception of Mann and Elric. Why even have lists if it is possible to remove the competition with a letter? I have played in the Society for eighteen years now, and I have never before witnessed such egregious conspiracy. 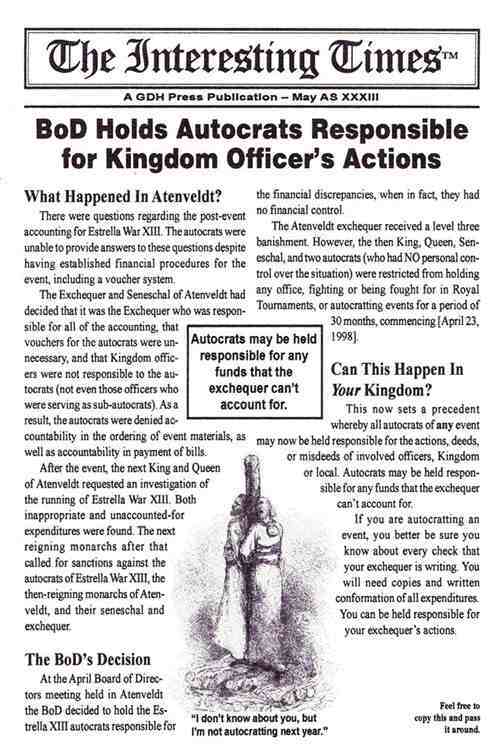 Of course, I was never a Kingdom Officer before, but I have a hard time believing that this sort of behavior is standard. I may not have agreed completely with everything Their Majesties Erik and Nichelle have done, but this petition goes beyond the bounds of all reasonable behavior. My sincere hope is that the petition brings to light those mean-spirited individuals who have been a blight on my Kingdom for some time. Order of the Laurel, Grant of Arms, Order of the Fleur du Soleil, Award of Arms, Order of the Maple Leaf, Order of Trypsichore's Mouffle, and Order of Services Performed Under Duress. A Legal Notice to the SCA Inc.